David Hornaday knows risk managers have to be more fluent and competent in the financial world. Just procuring insurance isn’t enough anymore. Working as a signalman for Consolidated Rail Corp. I did that for about a year and a half before I got my first risk management job as a claims agent for ConRail. That was a self-insured company, so they administered their own claims. ConRail got acquired by two different railroads and was split up, so I had the opportunity to either go with one of the railroads or look outside for another position, and I wanted to do more than just work with claims. I wanted to be exposed to the corporate risk management side of things. So I found a job as a risk manager for Suburban Propane in Whippany, N.J.
We’re working closely with brokers and underwriters and communicating internally to bring the insurance expertise to companies that need it. Risk managers should be aware of non-traditional risks and focusing on ERM, versus just the traditional insurance procurement function. That’s where the future of our profession is going. R&I:: What was the best location and year for the RIMS conference and why? This is a little self-serving, but I thought Vancouver in 2011 was great because I had never been there but always wanted to go. Risk managers have to be more fluent and competent in the financial world. Just procuring insurance isn’t enough anymore. You have to have a basic level of financial knowledge to communicate with not only internal treasury and CFOs, but also with underwriters and insurers. Social engineering. The onslaught of fraudsters is relentless. Companies have to be vigilant. But the coverage surrounding that sort of risk is also emerging, so risk managers will have to pay close attention to that and keep up with that evolving coverage. We had a major loss recently and there was a handful of insurers who paid on that claim which I thought were exceedingly professional: ACE (now Chubb), Ironshore and XL (now XL Catlin). We use a broker for everything. It probably was a little bit overblown, but I think it’s good that things are more transparent now. I’m probably a little more pessimistic than optimistic. I just don’t see signs of strength out there. There are still companies with tons of cash outside the U.S. which can’t really bring it back in a way that makes sense. U.S. oil production is way down since the price of oil is so low. Of course, the lower gas prices help the average consumer and lowers overhead costs for businesses, so it’s a little bit of a mixed bag. My mentor in this business is Joe Racansky. He was the director of risk management and my boss at CyTec Industries, and I learned as much from him as anybody in my career. Successfully resolving claims stemming from the Lac-Megantic train derailment in 2013. R&I: How many e-mails do you get in a day? R&I: How many do you answer? R&I:: What’s the best restaurant you’ve ever eaten at? Prime 112 in South Beach, Miami. It was the freshest tuna I’ve ever had, and it was with the team from Aon, so it was great food and great company. My favorite movie is “Bull Durham.” It’s a baseball movie. R&I: Who’s your favorite baseball team? Key West, Fla., is pretty interesting. My wife and I have been there a few times and you always see something different. I was moved by the Chris Kyle story. I thought his life and story were inspiring. I think they think I just buy insurance, when it’s really more comprehensive than that. They don’t know about meeting with underwriters and contract review and working on M&A deals. As cyber threats become more sophisticated, risk managers must understand and assess evolving exposures. Farms and ranches face a new set of exposures to their operations. 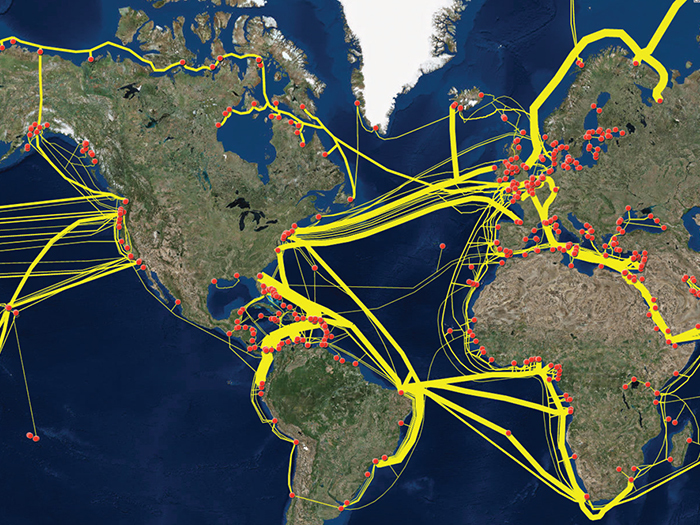 Businesses face risks from undersea data cable vulnerabilities. Populist anger propels non-traditional candidates whose policies could unravel the fabric of American commerce.